What a great run again in the beautiful Cooking Lake/Blackfoot Provincial Recreation area! First off, thanks to organizers of the Blackfoot Ultra and all the volunteers which did an amazing job taking care of everyone on the trails! The weather couldn't have been better: cool, a bit windy and overcast. Originally signed up for the 100 km race (4x 25k laps), I decided, two weeks before race day, to move down into the 50 km race. The reason being was my initial hunger for distance couldn't match the amount of time and preparation required to sustain a 100 km run, in fact, my training mostly consisted of running after my kids :) Kidding aside, I was able to put in a few longer runs here and there but you can't call this proper preparation in order to have a fast race. However, my main goal was to enjoy being outside and able to run. Sanja took me out to Islet Lake Staging Area where the race starts. 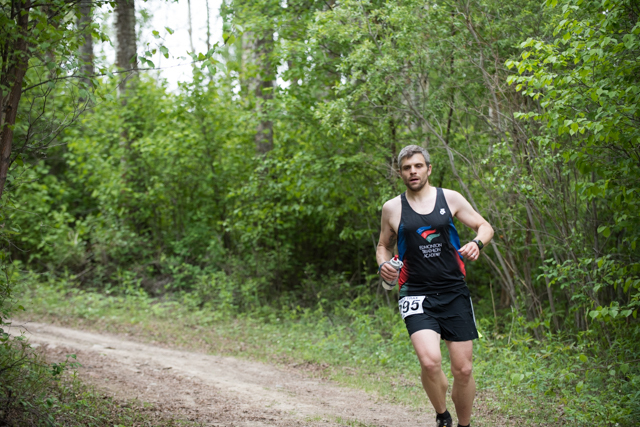 The 50 km race started at 9am, while the 100 km and 50 mile racers were already on the course at 5:00am and 6:30 am. I had friends running in the 50 k (Oleg and Chad), 100 k (Darren, who had an amazing race) and the 50 mile (Mevlut) and it was great to see them on the course. It was chilly in the morning and I was debating whether or not to wear arm warmers. Eventually, I went without them and it was a great decision. Once you are in the trials, it gets warm fairly quickly. So we took off and things went good. The first lap went well and I clocked 1:58 h. I saw that Oleg (who at that time I thought was first) wasn't too far head of me which kept me going. Right behind me more people and the two leading women (Stephanie and Deb). Trucking along at BFU 2015. Photo credit: Ian Holmes on FB, @irrationalcarny on IG and Twitter. At that point I didn't feel too bad. No signs of cramps yet and I was running fairly fluent. As always, I tried not to spent too much time in the aid station, only filling up my bottle and move on (although I started to look forward to the finisher hot dogs). I am not really sure where I started to fade but at some point it became really tough to not start walking. In order to not completely blow up, I decided to walk up the hills hoping to keep it going on the flats and downhills. It sorta worked, however soon I got passed by Stephanie. I tried to stick with her, which worked well for about a few km, until she realized Deb is on her heels. Then she put the hammer down and was gone. Not much later, Deb also passed me and I kept pushing to the finish coming in 5th overall. In the finish, I learned from Oleg that he wasn't first. In fact, the first guy had a lead of 27 min over Oleg and finished in 3:30h!!! Crazy stuff. Anyway, hot dog time! Only a few minutes later Sanja, her mum and the kids arrived and I was so happy to see them. It was a great day for me and I'm happy with the result. If you are interested in the course and details about elevation, check out my run on Strava. P.S. 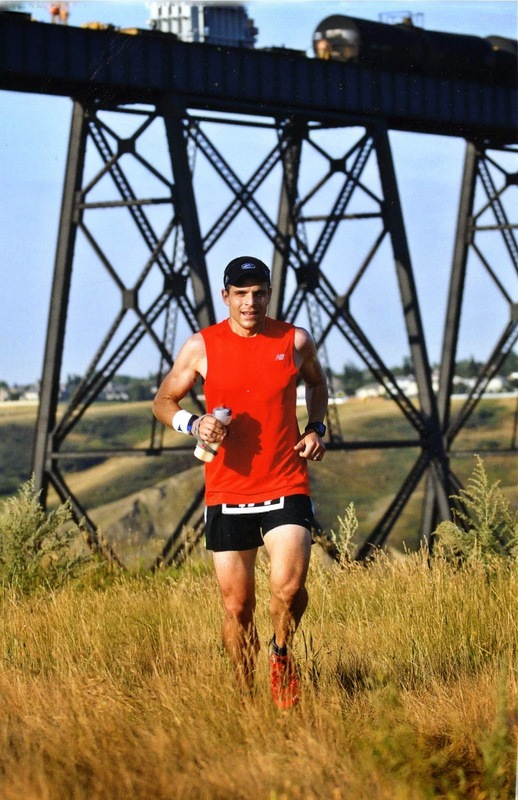 For some reason, I never wrote a race report for the River Valley Revenge Ultra I did in 2014; and doing it now feels kind of too late. So the least I can do is to say if you are interested in running past the marathon distance you should come to Edmonton and give this race a try! Sanja and I both did it (Sanja this year) and it was a blast. Amazing trial running in the "largest stretch of urban parkland in North America"!! What a beautiful fall day that was in Canmore! It couldn't have been better to run a 50k. 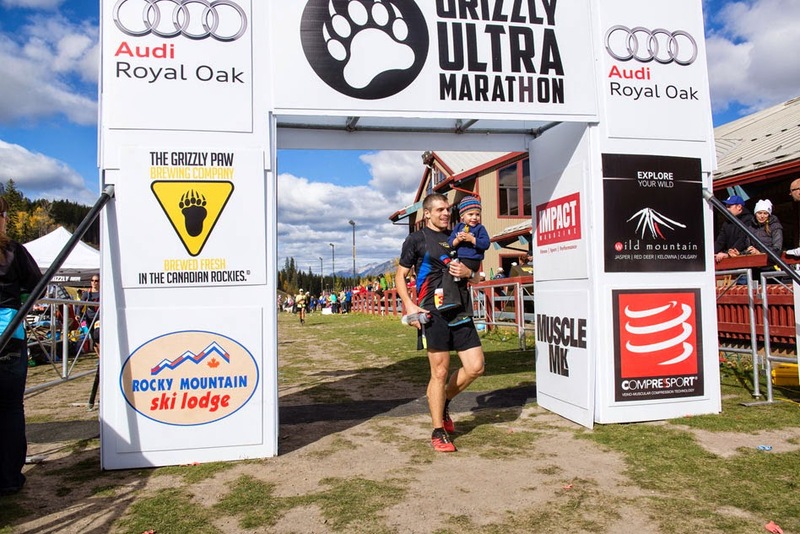 The Grizzly Ultra was one of the races I always wanted to do. Start and finish was at the Canmore Nordic Centre, which is nestled right at the foot of Mount Rundle. Sanja, Sean, Sawyer and I left Edmonton the day before and we stayed at our friends place for the night. On Sunday morning we headed the start and it was only 5°C. It felt pretty cold but I had good hopes that it will warm up eventually. I decided to run in shorts, t-shirt and my ETA running singlet on top. I also decided to run with my running backpack to ensure I have enough water and a place to carry my bear spray. The organizers made every participant (+1300!) carry bear spray due to the higher frequency of bear encounters during the this year. The race course consists of 5 loops, which start and finish at the Nordic Centre. So it's beautiful for family and spectators. Shortly before 9am, I went to the start line and seated myself not right at the front but within the first quarter I would say. I wasn't really convinced that I will have a good race due to the lack of running recently. Anyway, 3 - 2 - 1 - BANG and we were off. It started relatively quick, as if we are running a 5k, but a few minutes later I settled into a pace that feels comfortable. Half way through leg #1, I was so annoyed by my running back pack that I would have loved to just toss and pick it up after the race. It felt as if I was wasting so much energy. Then I decided I will drop the pack once I am back at the start and finish. Sanja and Sean were cheering me on, while Sawyer slept like a 6-week old baby sleeps :) I stopped, grabbed my bear spray, my hand-held water bottle and dropped the pack. WHAT A RELIEF! Leg #2 was a lot of fun, mostly because I felt so much better running without the pack. During leg #3, which featured beautiful single track, I hit the first mental down point in the race, and I could also feel my hamstrings twitching. At that point cramps are usually not far and I slowed down significantly. This seemed to help but I still didn't believe in myself because I haven't been running much. I tried to push these negative thoughts out of my mind and just enjoy being in the trails no matter what comes! Just one step at a time and you will finish eventually! This strategy seemed to work and I arrived at the Nordic Centre in relatively good spirits. Leg #4 was also very nice but felt super long, while only being around 8 km. Leg #5 was physically the worst (calves were now cramping too) but the shortest overall. I had a lot of walking breaks due to cramping and things started to hurt now. But hey, the good news is that goes for everyone! I actually "race-limped" myself during leg #5 from 10th place into 9th place overall! With about 1km to go, I checked what's going on behind me and I could see that more people started to catch up now. That was the point where I finally had to ignore the cramping legs and made sure I maintain my position, whatever that was at that point. Coming through the finish chute, my personal family cheer team was waiting, and Sean ran towards me shouting "Paaaapaaa". He jumped into my arms and we crossed the finish line together. This was the best finishing experience I have ever had. I am really thankful to my wonderful wife! She dealt with 2-year old toddler and a 6 week old baby at the same time, so that I could participate in this race! I love you! P.S. If you want to check out the race course on Strava, click here. Just a quick recap: I initially wanted to do the BF 50miler as a pre-race for the Lost Soul Ultra in September 2013. I was all signed up but I had to deal with a hip flexor injury, which prevented me from racing. Luckily, the organizers let you rollover to next years race if you are injured (at no cost). This is really something I really appreciate and which is pretty much unique and speaks for the great attitude of the organizers! Again, the preparation for this race didn’t work according to plan, as I was extremely busy with teaching in spring and also dealt with yet another injury, this time plantar fasciitis. I mainly focused on indoor cycling in the spring and started running again in April. With the race approaching, I wasn’t really sure whether I actually should toe the start line at all. It’s kind of pointless doing a 50-mile race when your longest run was 17k! In the end, I decided to just start and see how things unfold. Since the race covers 3 25k loops plus a 5k out and back at the beginning, I could always drop out once coming back to the start/finish area. Thanks to my good friend Glenn for picking me up in the morning and dropping me off at the start/finish area! Glenn has been supporting and accompanied me now for quite a few races now. Big thanks to you! So with no expectations in my head, I started the race with the sole goal of having a great day running on trails in the Blackfoot provincial recreation area. The weather was amazing and I felt awesome. I settled quickly into a comfortable pace and wasn’t concerned at all what was going on around me. After 10k, I was alone and couldn’t see anyone. There were 3 runners ahead of me who took off right after the start. The trails were really amazing and I really liked the rolling hills! Not too steep but many of them. Almost at the end of lap 1, I caught up to the third runner and passed him. I was extremely surprised since I wasn’t really going hard at that point. I kept on running my pace and finished the first 30k feeling really good. I was actually really surprised how well it was going considering the lack of run training. At the start/finish area, I could see the 2nd place runner and at that point I started to get a bit competitive. I pushed a little harder to get closer and it seemed to work. I eventually passed him and I kept on going. At kilometer 40, I felt that things are getting tough now. Nonetheless, I tried to maintain focused and just keep on moving – but from now on things went bad really quickly. My lower legs started to cramp (soleus muscle), and my gluteus medius muscles were screaming. My quads and hamstrings were fine, probably because I wasn’t really pushing it very hard. I managed to get to the last aid station (around km 50) before finishing the 2nd lap and that’s when it hit me hard. I was done. I walked a bit then tried running again but wasn’t able to run for longer than 30 seconds at a time. That’s when I decided to pull the plug once I am back in the start and finish area. After hitting the aid station in the start and finish area I ate some fruits and drank water and then wanted to let the race organizers know I will quit. Then I saw my friend Andrea McGregor, which I also met sometime ago on the course while I was still feeling good. She was doing to 50k race, which started a few hours later, and also had only one lap to go. She talked me into running with her this last lap and I decided to give it a try. We run about 1k or so when I had to stop running again. It was just not going to happen. I turned around went back and officially dropped the race. In the end, it was a DNF but nonetheless I got a solid 55km work out in. I also should be happy that I was able to run that far given my preparation. The smartest thing would have been to ask the RD before the race if I can start in the 50k instead of the 50-mile. But I decided to give it a try and see how things turn out and in the end I actually very much enjoyed the day. If you like ultra running on trails, you should definitely give this race a try!! It’s beautiful! If you want to see the location, elevation profile etc. check out my run on Strava. About 4 weeks ago, I finished my first 100k foot race: The Lost Soul Ultra (LSU). It took place in the beautiful Oldman River valley in Lethbridge, which is known for its coulees. According to www.dictionary.com a coulee is a deep ravine or gulch, usually dry, which has been formed by running water. During the race, multiple of these coulees had to be tackled resulting in a total ascent of 2800 m over 100 km. Good thing I didn’t do the 100 miles! Okay, but let’s start from the beginning. The race started on Friday morning and Sanja, Sean, Glenn and I arrived at the Lethbridge Lodge on Thursday evening. Without Glenn all of this wouldn’t have been possible. He made sure I get my nutrition at every aid station, helped Sanja to take care of Sean and also driving them back to the hotel when our little one needed his naps. On race morning we got up at about 6am, had breakfast and I started up my warm up routine. I was still very worried if I am going to make it due to my lack of training and my recent knee injury. At some point during a training run a few weeks back I suddenly got medial knee pain in the right leg. That was extremely disappointing as I just recovered my long lasting hip flexor injury. Nonetheless, I decided to give LSU a try and hopefully be able to finish in less than 15 hours, which would qualify me to enter the lottery for the Western States 100 Endurance run next year in Squaw Valley, CA. With an optimistic attitude and a smile, I started the run and the first kilometers were flying by. I still couldn’t believe that I just left for a 100 km run! The course is split into 6 segments: An initial 7.1k loop (south loop), followed by 8.3k to the first aid station (Softball Valley, or Pennaquim), 10k to second aid station (Pavan Park), then a 15.8km long loop (north loop) back to Pavan Park aid station, 7.8k back to Pennaquim aid station and 4.7k back to start/finish where I would begin my second loop going straight back to Pennaquim aid station. The 100-milers would do three full laps, including the south loop. Getting to the first aid station felt fast. The up/down hills were great and I started liking it. My knee was okay too. At aid station #1, I quickly checked in and out, grabbed a new bottle with Heed Perpetuem from Glenn and took off. Everything still felt good, but’s that not surprising given that I only ran 16k at this point. Somewhere between Pennaquim and Pavan Park aid station, I caught up to Oleg Tabelev. 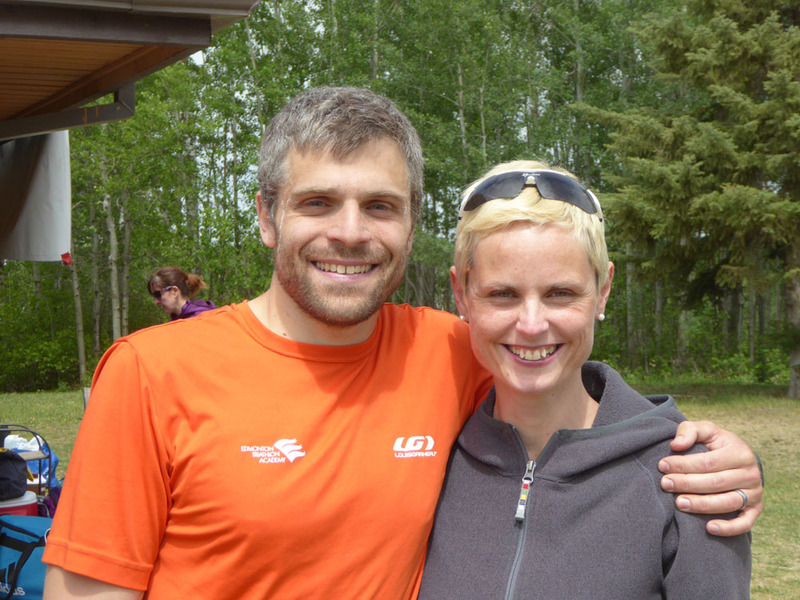 Since I was new to Ultra running, I only knew him from the results lists. We introduced each other and ran for a while. He’s a very good ultra-marathoner and well known here. He told me that I am in 3rd place in the 100k (he did the 100 miles) and that I should run it smart. Since I didn’t really know what smart means in a 100k race, I just did what he did: Walking up the hills, running the flats and cruising down the hills. I would usually pass him going up, and he would catch me going down. At some point though, it seemed as if I was pulling away from him. I reached the next aid station first and left when he came in. From here on we had to cover the big 16k north loop with only an unmanned water station. Right out of the aid station you had to run a little bit on the road, but then a sharp left turn and up the hill. Once I crested the hill, there was a big wide-open area with knee high grasses. I kept on running straight but couldn’t see the little marker flags anymore. Did I miss the turn? I kept on going for a while because I felt I was right. Still no flags. I recalled the race organizer telling us, if you cannot see a flags within 20-50m, turn around, you are running in the wrong direction. Well, okay I thought, let’s go back. I ran back and saw Oleg again as he reached the top of the hill and did a 90° turn to his left. Crap, I was off course. I ran back, probably too fast, trying to catch him again but I did not see him again. At this point things became more difficult for the first time in the race. My hamstrings were acting up and started twitching. Not cramping yet but I knew it’s just a matter of time. I slowed down quite a bit, hoping that would make them happy again. The north loop is relatively flat which was great at that point. After about 10min, I was able to pick up speed a little bit and came by a table with flats of bottled water. I wondered whether this is already the unmanned water station. I checked my Garmin and given the distance I ran, this couldn’t be the case. Then I recalled someone saying that a person who lives out there provides athletes with extra water. Very nice I thought grabbed two bottles, drank one right on the spot and filled up my hand-held bottle with the other. This stretch was on some sort of a road and seemed a bit boring to me. On this road my knee pain came through and intensified quickly. I told myself to forget about the knee and pay more attention to the flags making sure not missing another turn. After a while, the course made a sharp right turn, straight into the grass and up another hill. This was a steep one and my hamstrings signalled me right away to keep it easy. I did not oppose and slowly walked up the hill. Some winding up downs followed until the course came down the river. I remember there was quite some bushwhacking at some point. Now, the course followed the river but also directed us through thicker brush at times. At this point, I was not in the best shape anymore and couldn’t wait to finally get to the unmanned water station. And there it was finally, a little tent with gallons of water inside. Great, I thought, filled up and tried to not waste any time. Then to my surprise, I could see the 2nd placed runner in the 100k in front of me (maybe 300m away), but I was never able to catch him although it did motivate me very much (In fact, this guy won the race eventually with a negative split over the two 50k laps!!). 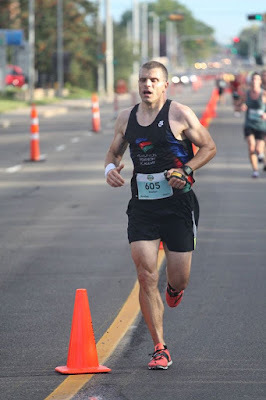 This north loop was mentally really hard and I wondered how I would feel here during lap number two. I kept on checking my Garmin more often now, which was clearly a sign that things are getting tough now. I made it to the Pavan aid station and saw Sanja running toward me. She was yelling and cheering and ran a little bit with me. Then I also saw Glenn who was playing with Sean. I checked-in and Sanja and Glenn did an awesome job supplying me with food and drinks. I told them that my legs were cramping and Sanja massaged my legs with ice bags. As I was almost ready to go again, the 4th person in the 100k rolled in. Her name was Alissa St. Laurent and she looked fresh and happy. When I saw her, I knew it’s only a matter of time when she will pass me. I left Pavan and headed straight into the next uphill. This was a monster! I managed to get over it but I knew the ups and downs wouldn’t stop till I reach the next aid station (Pennaquim). I started cramping again and had to stop and stretch a few times. From now on it was walking/running/stretching. I managed to get to Pennaquim where my amazing team was waiting for me. They took care of me and gave me drinks and Sanja stretched out my legs again. At that point Alissa passed me and was gone. I got ready again and left shortly after. Now it was much flatter till headquarters and I was able to jog again. Once I saw the big train bridge that goes across the river valley I knew it wasn’t far anymore. I kept on moving and soon arrived at the big hill right before start and finish. This thing is steeeep. I walked up and ran into the headquarters aid station, which also marks start and finish. Wow! I finished the first lap! As excited as I was, I knew there was another lap coming… another 50k of pushing forward. I switched socks, got all my drinks and Sanja took care of my legs again. At that point I could already see that my little toenail will go but it didn’t hurt. It took my about 5-7 min once I was ready to leave again. From here on things started to turn worse. I was able to maintain jogging/ walking/ stretching for another 10-15km, and then I decided jogging is over and I walked the rest of the remaining 30+ km. I kept a swift stride though but even that slowed down. It was an interesting feeling when even walking is so painful that you have to slow down. For the rest of the race there was nothing exciting happening. Although I was walking, I didn’t get passed for a long time. Then sometime after the unmanned aid station (north loop) I got passed from another 100k runner. Heading into Pavan, I was in pain. My support crew did a great job in keeping me motivated and I headed out again. Sanja walked with me a little bit and did an amazing job dealing with me at that point. Mentally, I was on the edge of breaking apart but I just looked down and kept hiking up and down the coulees. I am not sure how long it took from Pavan to Pennaquim but heading into this last aid station I started to feel somewhat better. Glenn was waiting there for me and Sanja was already in the Hotel putting Sean to bed. At that point it was dark and I had to wear my headlamp when I left the aid station. This last part was actually quite fun now! Navigating in the dark in the Lethbridge River Valley was awesome! It wasn’t really difficult as there were little marker flags with reflectors so you could definitely not get lost (and lose your soul in the dark). I passed a female racer in the woods and tried to be very loud so that I would not scare her. It was pitch black and kind of scary. Knowing the finish is close kept on making me walk quicker and quicker. And then finally, that last big hill! I walked it up and made my way to the finish. I didn’t even attempt to run across the finish line and just kept walking. I thought it was kind of silly after I was walking for 30+ km to suddenly start running for 100m. But that’s just me. Sanja was waiting in the finish and I was extremely happy to see her there. I sat down and chatted with a few other racers and their experience. At that point I didn’t feel any pain. I ate 2 hot dogs and after 30min I wanted to get up but it didn’t work! Sanja helped me up and I was limping with her to our room. My knee was busted. In the end it finished 4th in my age group in a time of 13:38:32. What a tough race! 100km, 2800m of elevation and I cannot believe I actually made it!! If you want to check out my race on Strava, click here. The scares of the battle: a messed-up right knee, a pulled left hamstring, two bloody toe nails and the soles of my feet felt like they got sandblasted. It took my knee about 4 months to recover but it was a great experience nonetheless, however without Sanja, Sean and Glenn I wouldn’t have been able to finish the way I did. THANKS GUYS! In the finish and happy to be done! It's been a while since I posted here the last time. If you followed my blog, you probably read that I head some hip flexor issues. Good news is it finally healed up, bad news is now my right knee is somewhat uncooperative recently. Due to the hip flexor injury, I wasn't able to participate in the Blackfoot 50-miler, which I was really looking forward to. Now with the Lost Soul Ultra (100km for me) coming up, I am a little bit afraid what is going to happen there ... Not only that the knee is troubling me, but also due to both injuries, I wasn't able to really train for the Ultra distance. Now I am consistently asking myself whether it will be a good idea to give it a try this weekend or whether it will lead into even more injury ... But since I already pulled the plug for the Blackfoot 50-miler earlier this year, I will now at least toe the start line, give it a try and see how things unfold during this hopefully sub 15h journey. Nonetheless, I also had a wonderful longer run with Pat and Ben when we ran Skyline Trail during August long weekend. It was also Pat's bachelor party :) Here the video if you are interested: Skyline 2013. I tried to take a time lapse of this run with my GoPro strapped on my forehead but this resulted in a awkward running technique to keep my head levelled. In the end the whole time lapse didn't work out and Pat's little videos were WAAAAY better as you can see in the Youtube clip. This was a great run and it gave me some confidence that I can, even with barely any run training, have good long run. With this run in my legs I decided to try Lost Soul and see how it unfolds.